No. 11 Virginia Tech fell to Clemson 59-51 in Littlejohn Coliseum on Saturday afternoon. The Hokies dropped to 18-5 overall and 7-4 in the ACC, while suffering their first two-game losing streak of the season. The Tigers improved to 15-8 overall and 5-5 in conference play to put themselves squarely on the bubble. Clemson has now won four games in a row. Virginia Tech’s offense struggled again with Justin Robinson missing his third consecutive game with a foot injury. Virginia Tech was facing a Clemson team that ranked No. 21 nationally in Ken Pomeroy’s defensive metric coming into the game. The Tigers held Georgia Tech to 42 points and Wake Forest to 37 points in their two most recent games, and missing the school’s all-time leader in assists, the Hokies also had a tough go of it on the road. Tech was just 15-of-53 (28.3%) from the field and only 5-of-19 (26.3%) from three-point range as they struggled to find rhythm in their offense with Robinson out. They were 16-of-17 (94.1%) from the free throw line, but that wasn’t enough. 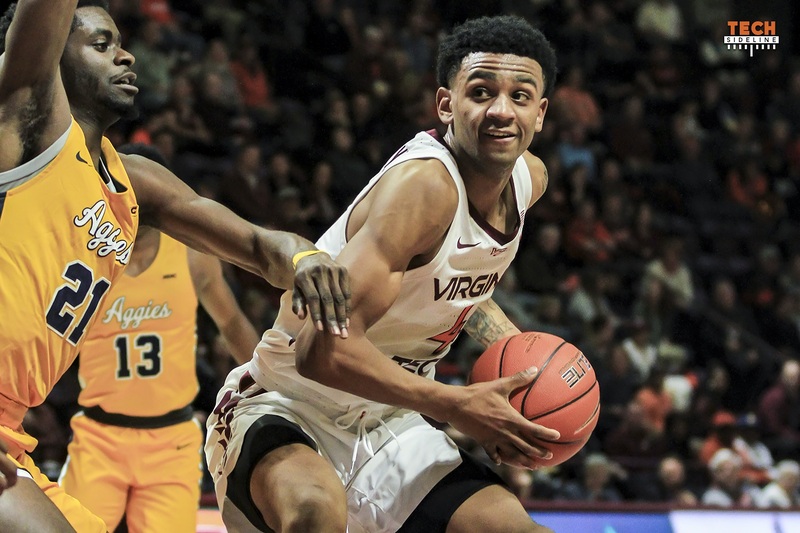 Clemson was hardly stellar offensively, failing to break 60 points and shooting just 41.3% from the field, but it was enough to knock off the punchless Hokies. Kerry Blackshear led Tech with 17 points on 5-of-8 shooting, and he also had seven rebounds, two steals and a block. However, he and Ty Outlaw (10 points, 3-of-5) were the only Tech players to shoot over 50% from the field, and Blackshear fouled out after just 26 minutes of playing time. Still adjusting to the point guard role, Nickeil Alexander-Walker had 13 points, but he was only 3-of-14 from the field. He had no assists and five turnovers. Ahmed Hill was 3-of-11 from the field, while Wabissa Bede was 0-of-7. The Hokies also got relatively little production from their very short bench. Isaiah Wilkins did not score in 14 minutes, going 0-of-5, while fellow freshman guard Jonathan Kabongo had three points in eight minutes. Tech did a better job protecting the ball in this game, committing just 11 turnovers, including only three in the first half, but they struggled to get decent shots in their halfcourt offense, and when they did they usually missed them. Tech trailed 33-29 at halftime, and they stayed in the game for the entirety of the second half. The Tigers jumped up by six points after their first possession of the second half, but the Hokies then cut the lead to three points on five occasions in the final 20 minutes, and to one point on one occasion. They stayed in the game by playing quality defense, as they’ve done for most of the season, but it wasn’t enough to overcome their lack of firepower on the offensive end, particularly against a team as good as Clemson is defensively. Since losing Justin Robinson, Virginia Tech has averaged just 54 points per game. In the eight ACC games they played with Robinson, they averaged 74.8 points per game. Despite the setback, the Hokies have two very winnable games coming up. They host Georgia Tech (11-12, 3-7) in Cassell Coliseum on Wednesday, and then travel to Pitt (12-11, 2-8) next Saturday. Tipoff for the Georgia Tech game is set for 8pm, and the game will be televised by Raycom. Check this list of local affiliates for the broadcast in your area. I feel bad for Buzz and the kids. Very good effort but just too thin to win in ACC. Will we ever get a full team? It has gone beyond ridiculous how few scholarship players we have each year. Hoping for a miracle. This team deserves it. CC, do you or does anyone have any update on how our 4 player signees for next season are doing? Also, any word on McNeilly’s nephews status for requalifying to commit to us for next season. I believe he still is in Canada. Any word on how he’s performing and what’s his size and desired position? If I was the opposing coach, I’d follow Clemson’s plan. Lightly cover Bede (who can’t or won’t score). Double Walker-Alexander. Blackshear will get some points in the paint, but will likely foul out. Game over. Without Robinson, the Hokies are toast. Hokies played great D today. But our shooting was terrible. That was the difference. Was hoping NAW would step up, instead he has stepped DOWN! Trying to hard, getting out of his normal game isn’t working. Why is it that we have been so damn unlucky with injuries and other outside problems of all kinds over the last couple of decades? We have had 7-9 healthy scholarship players at this time of the season forerver! Do we have a timetable as to when J Rob will be back? So frustrating not to have more depth. No. With Bebe being a black hole on offense, their d collapsed down and passing lanes were closed. Also did not get the looks. Not as many and not as early. Definitely not a matter of just not hitting the shots. Extra pass not ther. Robinson penetration not their and less open looks. Was at the game. Miserable. if NAW is to be nba point guard, i think he would need another year to hone his craft. Disagree that the offense is running well without JRob. Absolutely not. It looks discombobulated nearly every possession. Painful to watch. We were starting our offense 5-8 feet beyond the arc and other than Blackshear’s solid play, every made shot feels almost lucky. There was at least 7-8 possessions in a row in the 2nd half where we could have tied the game but every player seemed too scared to step up and make a big shot. Bricks or turnovers possession after possession. Bede is zero scoring threat. Hill was a ghost again. I love Outlaw, wish Buzz would actually run a play to free him up for an open 3 once in a while. NAW has very poor decision making ability when handling the ball. He is absolutely NOT an NBA caliber point guard. Incredibly slow first step, looks like an old man driving, no vertical leap when driving, just looks to get bailed out by a foul. He had 0 assists and 5 turnovers. Enough said. Come back another year if the plan is to play point in the league. Presently he looks like a backup 2 guard in the league to me. But because of the media hype he will leave and get his money. Heading for 9-9 in conf and the dreaded 8/9 game again would be my guess. It’s pretty obvious that without #5, we do not have another point guard or facilitator on the team. To compensate for his absence, CBW has told the players to attack the basket. Unfortunately, no one else on the team seems capable of attacking the lane to take the pressure off the others to get them uncontested shots. Instead they seem totally out of their comfort zone, attempting drives, passes and/or moves that look forced and are usually unsuccessful. I’m not sure it’s possible but I think we’d be better off focusing on picking/screening for three point shots which has been the team’s strong point and minimize trying to attack the hoop because it isn’t working. Unless we can find a different approach, this team may have a hard time winning anymore games with #5. On the brighter side I did think KJ played one of his best offensive games. He played hard, within himself and was efficient. Still very proud of this team and wish them success. Life in the ACC is tough and we do not have enough players to win. I long for the day when we have all 13 players on the roster. Got to have more players!!!! It’s certainly obvious that JRob’s absence is the difference for today’s and UofL losses. I think we win both games if he’s playing as he certainly sets up lots of our shooting and that just can’t be easily replaced. I missed watching most of today’s game, but I give this team credit for hanging around until the end as we still had our chance to win despite the poor shooting. It’s just hard to have same results without your best overall player on the team which was already short on depth! It’s disappointing, but I don’t think lack of effort is part of the problem and I like the character of this team. Here’s hoping both PJ and JRob are back sooner rather than later as well as getting W’s on next two (GT&Pitt). Let’s Go Hokies!